Hand crafter Deer Hunter Bolt Action pen with gift box. Hand crafted one of a kind pen with true bolt action mechanism. 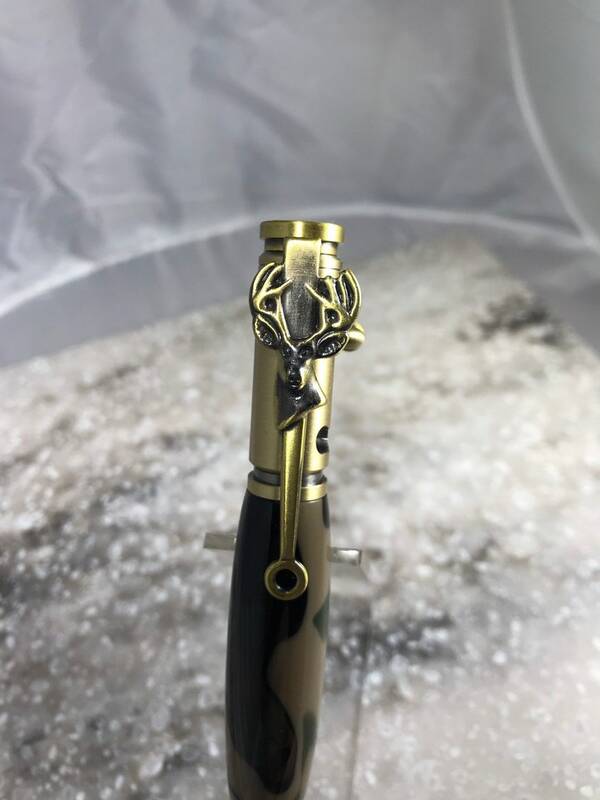 This hunter themed pen features a cast deer mount and sight scope clip. On the pen tip you will notice etching that includes a deer with antlers. Finished in antique brass with a jungle camouflage acrylic body. A realistic cool pen for the hunting enthusiast. Color of ink is black and uses a standard Parker refill. Total pen length is approx. 5 inches. Price includes slide out gift box for easy gifting. Stock#11. NH Made store has no sales tax. Hand crafted Salute The Troops Bolt Action pen with gift box. Hand crafted Gear Shifter pen with gift box. Razor handle is beautiful! I really like it! Men's Gillette Fusion custom made razor handle with one blade and slide out gift box. Fast shipping, great product, A+++++ Thank you! Beautifully made item that shipped very quickly. Thank you! Only PayPal payments accepted at this time. Every item listed on Etsy has passed my personal high standards of quality. I will not list an item unless I feel it meets top quality in appearance & functions correctly. If you have an issue with any of my products, please contact me. I want you to be happy with your purchase & will work with you if a problem arises. USPS Priority Flat Rate to United States destinations only. Average delivery time frame is 2 to 3 business days from date of shipment. Purchases completed before 7 PM EST. will be shipped the following business day. Purchases completed after 7 PM EST. will be shipped within 2 business days. 50 Caliber Machine Gun pen with gift box. Safety razor handle with slide out gift box. Gillette Mach 3 custom made acrylic razor handle with slide out gift box. Gillette Mach 3 Magnum bullet custom made acrylic razor handle with slide out gift box.